Hello again! After six weeks of travel, I am back in New York City. I was all over the US, parts of Europe, South Africa, and Madagascar. There’s a lot – A LOT – of new content coming and I’m kicking it off today with an epic photo post from my visit. Because who doesn’t love animals, right? When I first went to South Africa, I stuck to the west coast, landing in Cape Town and traveling north into Namibia (or “Nambia,” as El Presidente likes to call it) before trekking across Southern Africa. 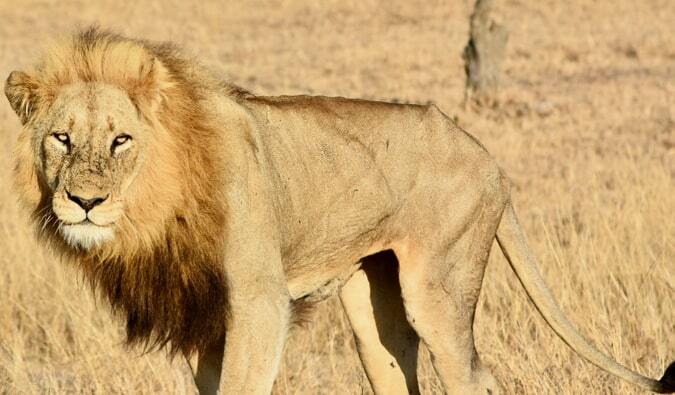 Because of that, I missed one of place I’ve longed to visit: Kruger National Park. 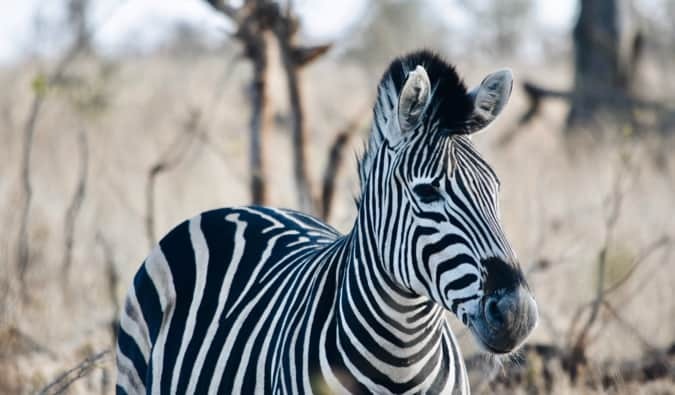 Possibly one of the most famous parks in the world, Kruger is one of the largest game reserves on the continent and covers an area of 19,485 square kilometers (7,523 sq. mi. ), sharing borders with Mozambique to the east and Zimbabwe to the north. 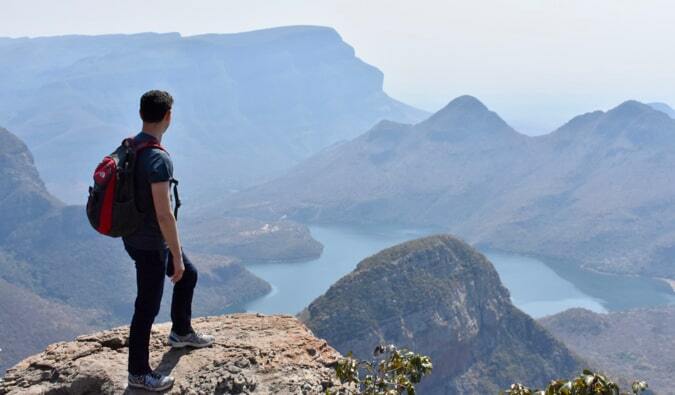 It was first protected in 1898 and became South Africa’s first national park in 1926. According to the government, over 1.6 million people visit it each year. I’ve long dreamed of going on safari there, spotting lions, elephants, cheetahs, leopards, and my personal favorite, the honey badger. 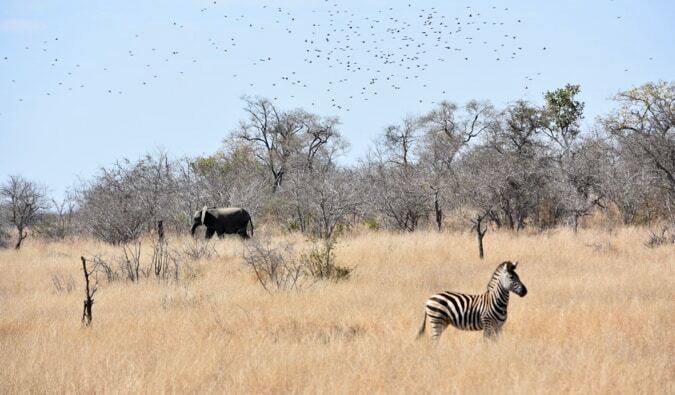 You always hear how great Kruger is for safaris. It’s like an animal lover’s utopia. I saw sunrises and sunsets that made my heart go aflutter. The red sun rose and set, letting us know that he is the king of the sky. And after he retired for the day, I watched the sky twinkle with stars, unpolluted by city light, with the Milky Way clouding the sky. There’s just something magical about being in the Africa savannah. It’s as if my Neanderthal DNA called out to me through my blood, recognizing its long lost home. And the only way to show you that majesty is through pictures, as they do more justice to the park than my words ever could. A male lion looking at me like I’m food. 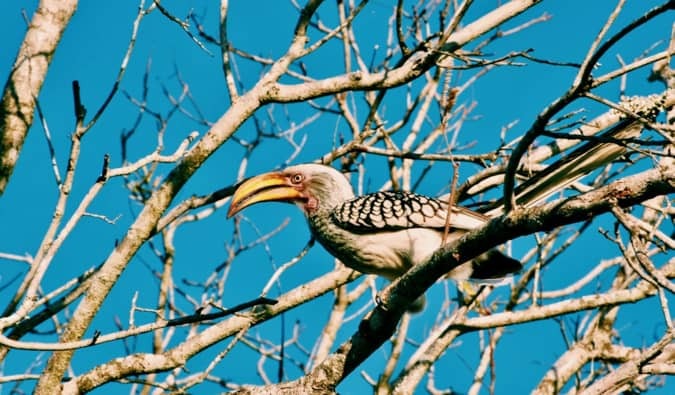 The Southern yellow-billed hornbill, which was as massive as it seemed. Getting up close and personal with a zebra. A cute little monkey just hanging around! 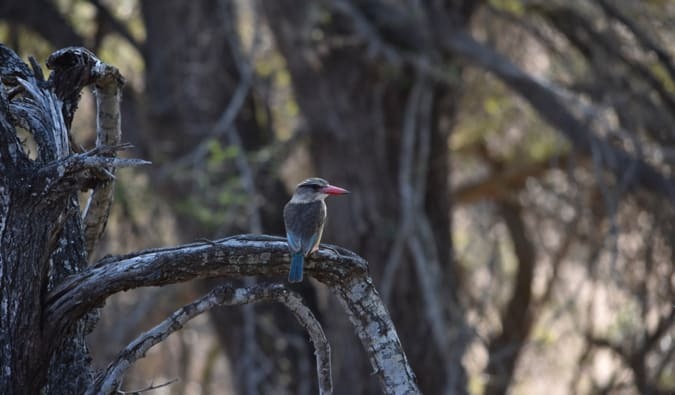 A female grey headed king fisher! A zebra and elephant each going their own way. A cute little bush baby! 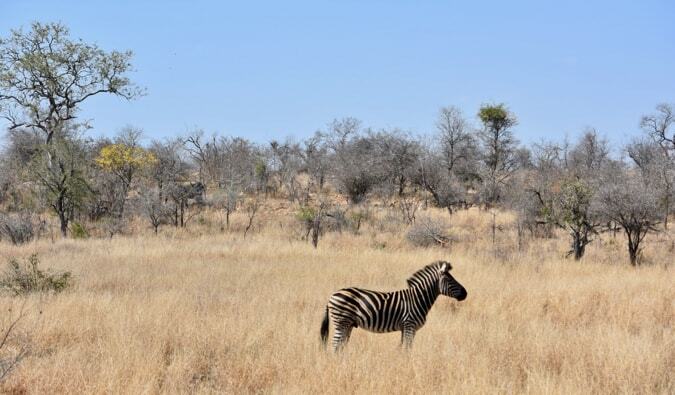 A lonely zebra on the savannah. 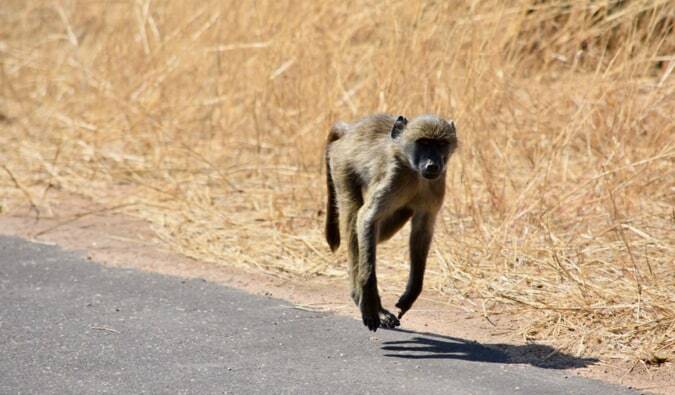 A monkey following us on the road (probably looking for a free ride!). 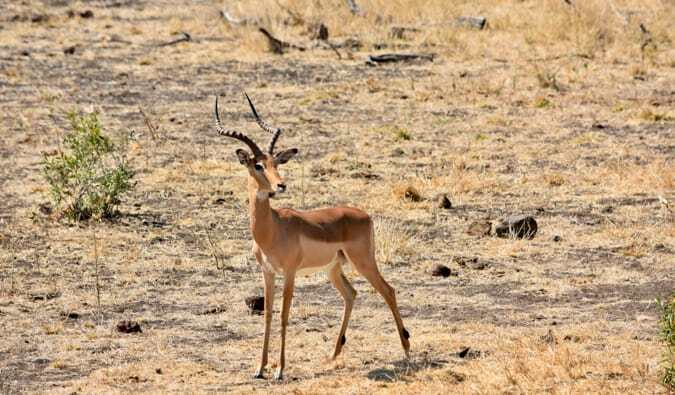 A worried-looking impala. Don’t worry it was just our engine that freaked him out. Elephants playing in the mud. We sat there and watched them for about 20 minutes. They looked like they were having some fun! More elephants. You can never have enough. A giraffe. We went a long time before seeing any and then I felt like I saw everyone in the entire park. They were everywhere! A zebra smiling for the camera! 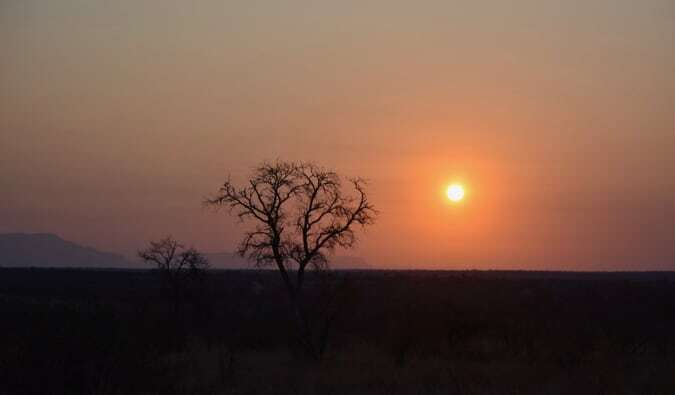 The sunsets (and sunrises) in Kruger are simply stunning. The sun is always this vibrant red. Very powerful. 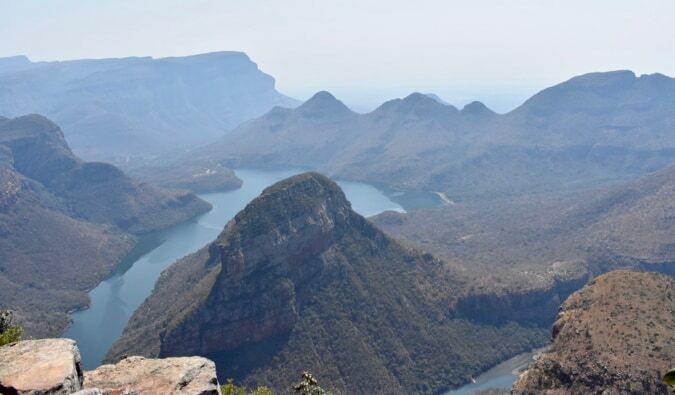 The incredible Blyde River Canyon! 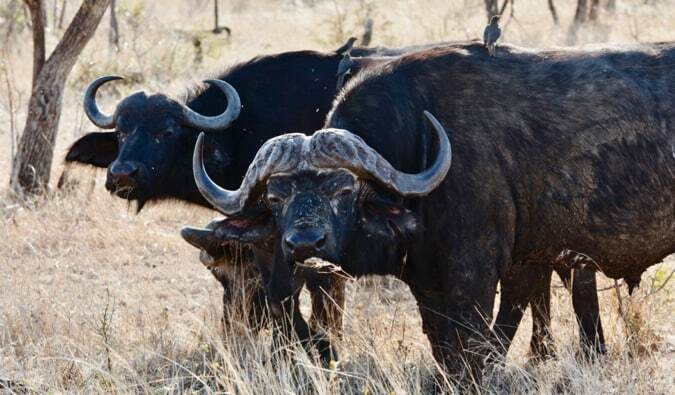 Cape buffalo, one of the Big Five. 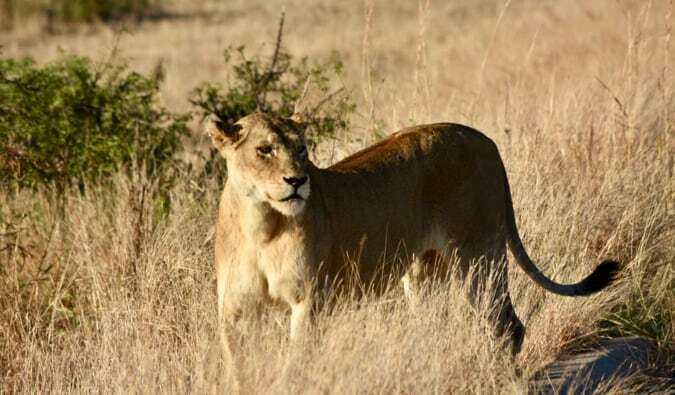 A lioness on the hunt. A baby elephant and its family. ***Kruger National Park is pretty easy to visit if you have a car (you can just drive there and stay at a lodge), but while I noticed a lot of people self-driving through the park, having a guide to spot animals and explain the ecosystem of the park made the experience much richer (these guys have eagle eyes!). It was nice to hear some history of the park and learn about the bush, how the animals there interact, and about poaching and how they are combating it, as well as hear opinions on dealing with the influx of tourists. You don’t get that when you go alone. 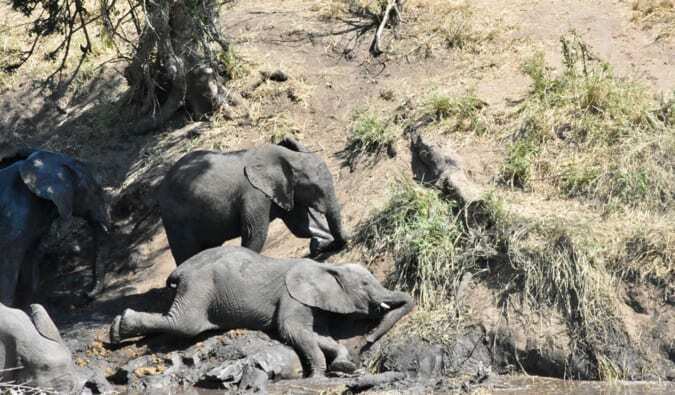 If you’re going to Kruger, the end of the dry season (August–November) is the best time to visit, because the lack of watering holes means animals have fewer places to congregate around, making them easier to see. I wrote a lot while I was away so over the next coming weeks, I’ll be sharing posts on Madagascar, South Africa, Vienna, and possibly the most epic travel giveaway ever! 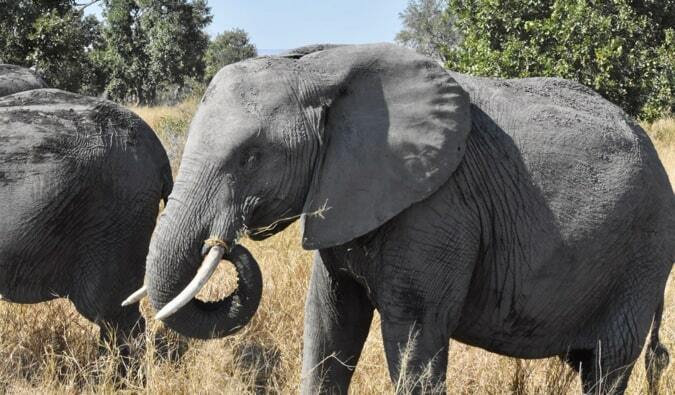 Note: Intrepid Travel, our partner tour company, covered my trip to Kruger, providing the car, guide, and lodging. Flights to South Africa and food were at my own expense. Intrepid offers readers 10% off on their trip so check them out if you want a fun tour company at a cheaper price. 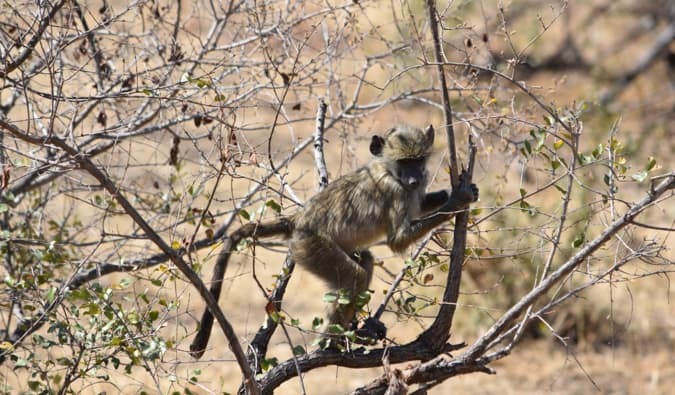 Great pics, Kruger is a spectacular place! Your pic of an Eland is really a Nyala though. Thanks for sharing. Great pictures! I got lucky and saw 3 (!!) honey badgers on my safari in Kruger! Including a mom carrying a baby. It was so cool!! Amazing photos and sounds like a wonderful trip! I was fortunate to visit the Mala Mala Reserve this year which is part of Sabi Sands, which shares a border with Kruger (and no fences between the two). I think your eland photo might be a nyala, though. These are fabulous images dude. Great shots. Kruger. I watched so many nature shows of the place when I was a kid in the US. I recall seeing the Big 5 quite a bit, life and death, the eternal dance we tend to see in more raw, pristine, natural places on earth. The beauty your images captures is inspired. Especially those sunrise and sunset photos. I know what you mean too when explaining how the cro-magnon-matt felt like it wanted to come out, being in such a place. I have experienced this once or twice, being in spots where no humans exist for miles. When you get away from civilization and it is just you, nature and nothing else, the animals, trees, and natural cycles teach you lessons you always knew, but just had to be around, without the mind or human interference, to allow these truths to take route. Some folks go on safari to get away from it all. When I do go, I am heading to Africa to return to where it all is. Big difference. Once which I am sure you experienced during your magical stay in Kruger. Out of all the images, each one rocking, I enjoyed that busy baby one the most. What cute and fascinating little creatures these guys are. Thanks for the fab post Matt, and welcome back to NYC. This is on our bucketlist! Great shots you got Matt. 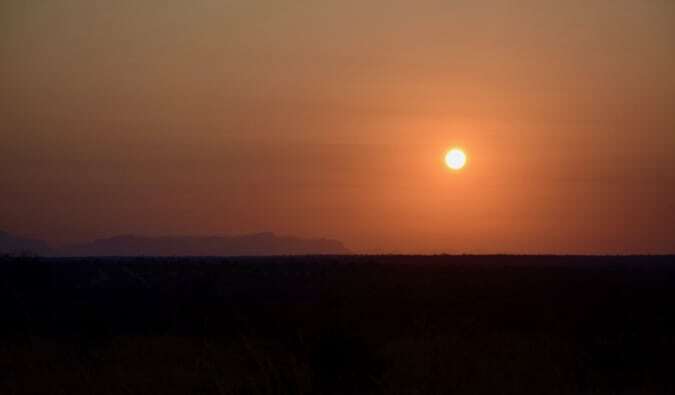 Your pictures are absolutely stunning, making one wonder why the African continent is also known as “Dark Star.” Africa is the only inhabited continent I’ve never been, too. I feel that a traveller needs to be ready to take it on (correct me if I’m wrong! ), and when one does, it’s going to be one of the wildest and most adventurous and most culture-shocking experiences any Westerner could possibly encounter. I’ve been following your blog for years and I’m always glad to see that you’ve shared yet another amazing experience. Those pictures speak a million words, each. I’m hooked. It was already on the list; but it got just bumped up big time! 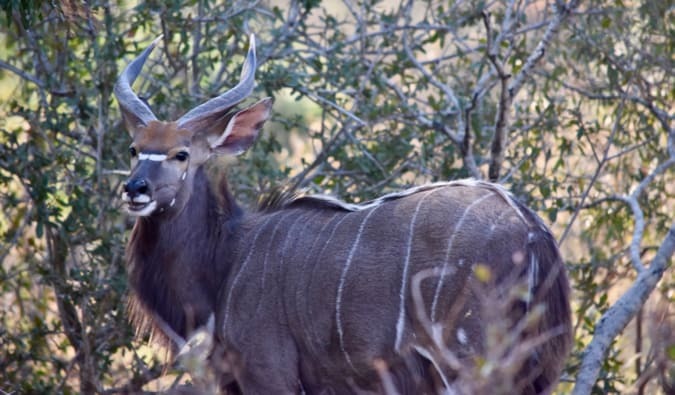 Your pic of Eland is actually a Nyala bull. Just wondering, how’s the animal viewing during wet season? 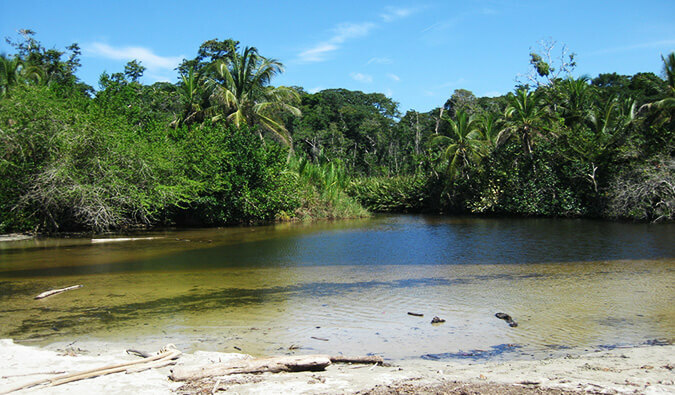 I’m planning a trip there around Jan-Feb.
My guide said it’s harder since the grass is taller and the the animals are more spread out as there are more watering holes for them. I’m not it’s not impossible though. You’ll have to let us know! However, a pro of the wet season means higher probability of cute animal babies, which are often born as the rain arrives. Plus Blyde River Canyon is green. That’s very true! No season is perfect. Wow, I have heard a great deal about Kruger National Park and I must say that your images lives fully up to what I have heard. It is a must go! 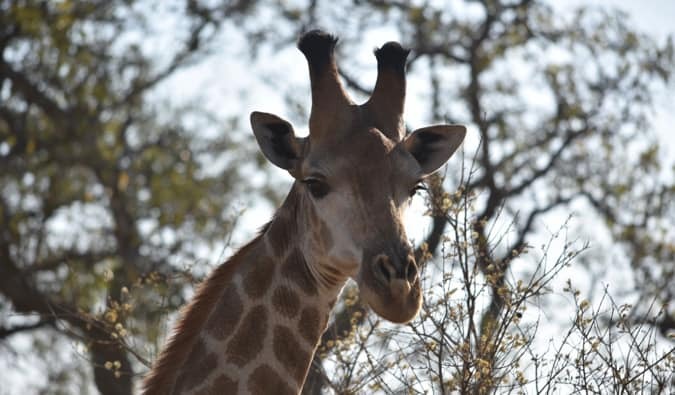 A beautiful descriptive piece on our Kruger National Park. Enticing even to me, South African! 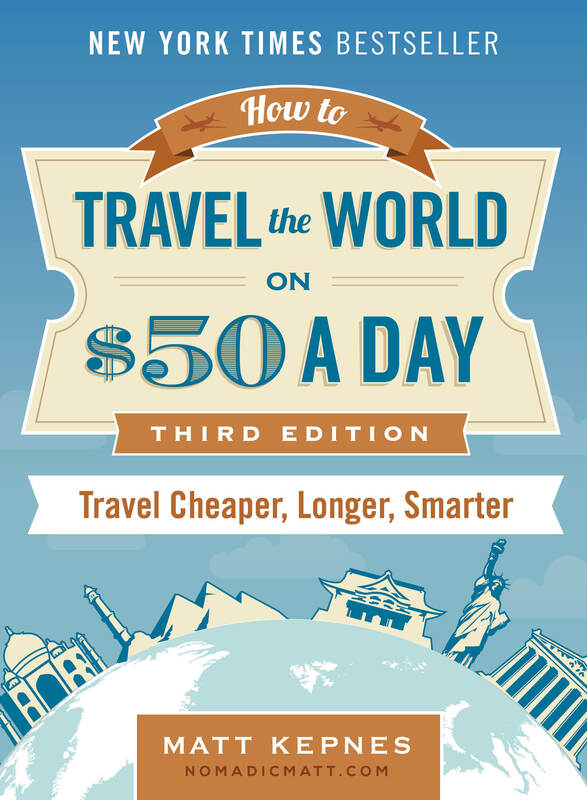 Would like to read your writings on other countries’ attractions. Thanks for sharing your Kruger experience, really great. My wife this blog. How is the weather End June to July as we intend visiting next year God willing. I was also in Kruger last month. I didn’t see you there! I dared a self drive safari and it was a great decision. I was able to rent a car from $80 a week and even couchsurfing inside the park with a ranger. Then I paid $25 per day in Kruger entry fees plus gas. 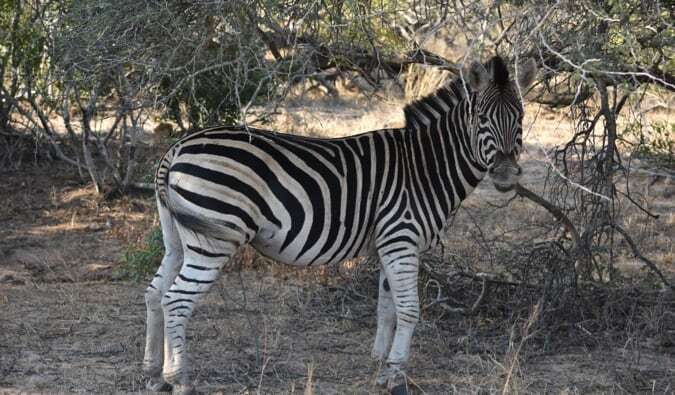 I was able to see everything you did on your tour, and the setup in Kruger is so easy for self drive. The highlight was when the leopard crossed the road immediately in front of my car ! Blyde river canyon was also beautiful. I’ve done a guided budget safari in Kenya (much cheaper than same experience in South Africa), so the self drive was cool. Plus I’m a wildlife biologist so a guide wasn’t as important for me (I only saw my ranger host in the evening). Btw, I’m in Dubai Airport en route to the US after an amazing time in Sri Lanka and the Maldives. Your blog posts on both destinations were insightful. I must warn you though: maafushi is even more built up than what you described . It now has 70+ hotels and dozens more going up. Hard to believe there were none prior to 2014. I only spent a night there, as I took the now $4 ferry from Male to maafushi and then a $15 speed boat from maafushi to an amazing resort, as opposed to taking the resort’s speed boat from Male for $125 each way. Also, now there is a private scheduled speed boat to maafushi for $25 that leaves 4 Times daily. I talked to locals and they told me they were going to artificially enlarge maafushi Island to make room for the huge influx of tourists. Traveling all that way to see an artificial island doesn’t seem appealing to me. Sorry I’ll miss you at FTU Chicago next month. I saw you at the nytimes travel show last year but didn’t get a chance to meet you. Maybe if you’re there this year. I got so excited seeing elk at Grand Canyon. 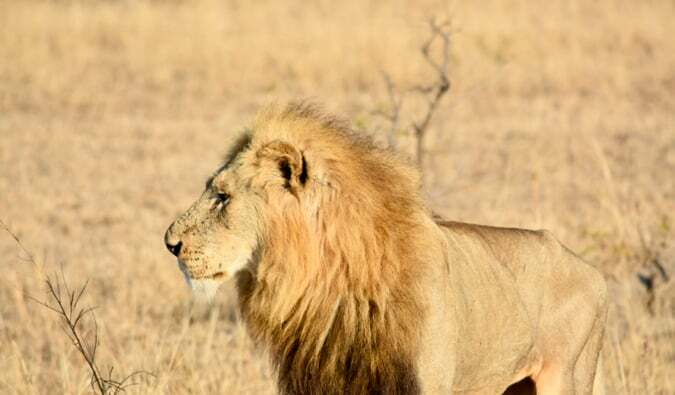 I cannot imagine the feeling of seeing so many different types of wild animals, particularly the Cape buffalo, or lions. I will get there in the next couple years! Thank you for sharing the experience in the meantime. Great photos! I am so jealous… am African safari is totally on my bucket list. One day!! Is a nice experience and it is a dream for me to be in that place, I share the pleasure of enjoying exotic animals. I love to see their habitat and observe how animals relate to each other. Wow! 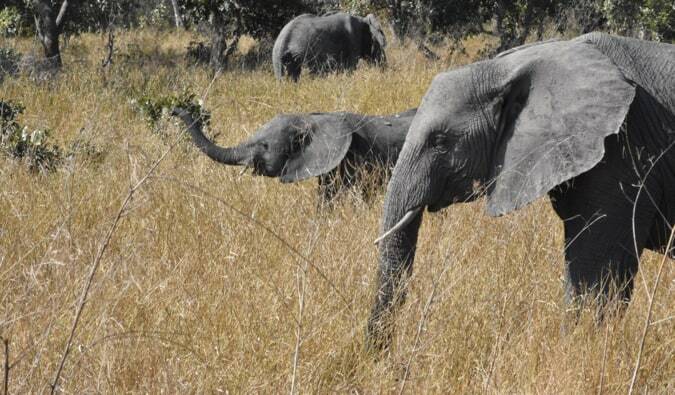 I have been on safari in Tanzania and it was amazing. So jealous you saw a bush baby! Going to Africa is still a big dream for me. 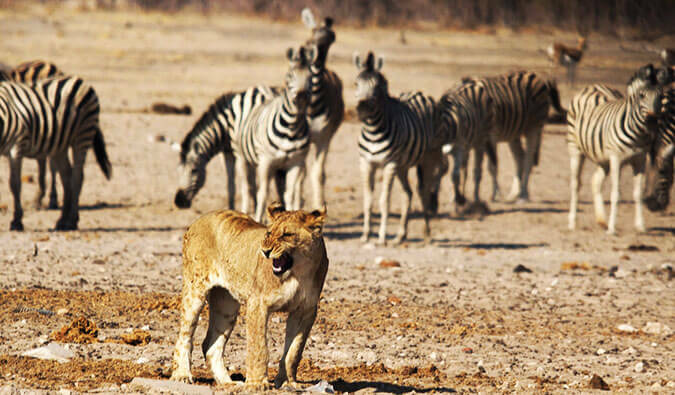 Since I was a kid I used to watch the documentaries and dream about going there, specially to Kruger National Park. Seeing all those animals in their natural habitat is such a bless! On a night drive the field guides have to use spotlights to find animals, but they will never shine the (very bright) light into the eyes of the animals. 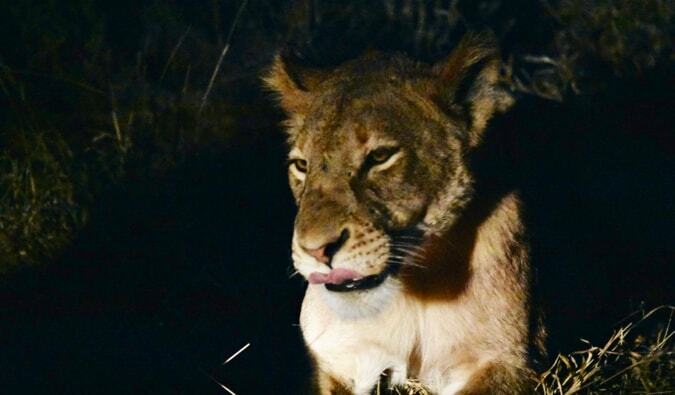 It doesn’t look as though the light was shone onto the face of the lioness in your photo, but next to her, which would not have bothered her. If a guide does indeed shine a light into the eyes of animals they should be reported, but it is unlikely to happen intentionally. 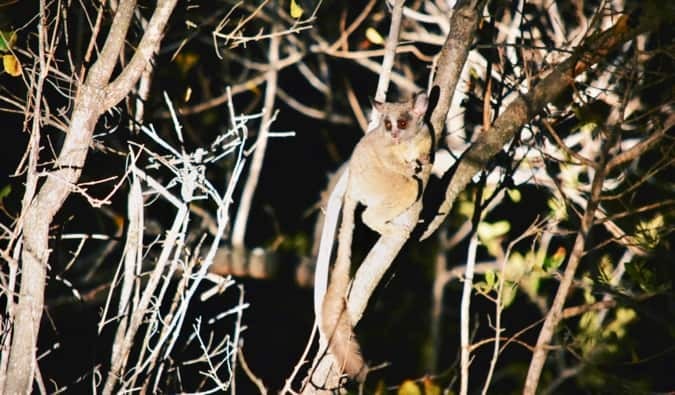 Lucky you for seeing a bushbaby! Great photos!! Love the bushbaby!! Sorry you didn’t get to see your honey badger though! I have been traveling around South Africa/Africa since early December. I didn’t get to Kruger but I did go to Chobe and Etosha. What a wonderful experience! It’s nice that Intrepid sponsored some of your trip and offers 10% off for your followers but to be honest, I am not a big fan of their customer service.